You don’t have to be a football fan to love Oregon’s college towns. But it sure makes a great excuse for a fall road trip. For October, hit the road to Corvallis. 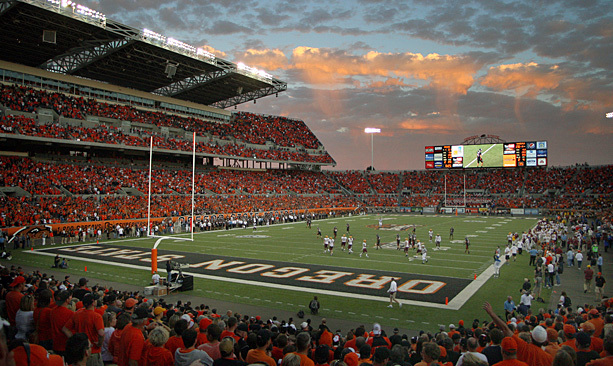 Show your spirit: Cheer for the Oregon State University Beavers at a home game at Reser Stadium. The Beavers take on Utah at the October 20 homecoming game and play Arizona State, California and the University of Oregon later in the season. Raise a pint: Grab a hometown beer and a burger at Block 15 right off campus in the 1920s former Gazette-Times building. Lagers, reds, IPAs, stouts and more — it’s all there. Check out the annual Blocktoberfest on October 13. Fill your plate: For breakfast or lunch, try the Broken Yolk, a popular and kid-friendly spot serving breakfast all day. For dinner, Big River Restaurant on the banks of the Willamette River remains the place to see-and-be-seen. Enjoy a Northwest “fusion” menu and live jazz on the weekends. Take a hike: Head for Marys Peak (4,097 feet), the highest point in the Coast Range with views of the ocean from the summit. Area hikes vary in length from 0.5 miles to 6.5 miles. Nearer town, take in the old growth trees in the Peavy Arboretum (part of OSU’s working forest). On the northwest side of town, check out the views from the hills of the Timberhill Natural Area. Walk through history: Benton County Historical Museum is housed in a 19th-century college building turned museum, research library and gallery. It preserves the historical artifacts, photographs and manuscripts of the county.